Copyright © 2008 Creative Commons. This work is licensed under a Creative Commons Attribution License, v3.0. Please provide attribution to Creative Commons and the URL http://creativecommons.org/projects/ccrel. It is also available under the W3C Document License. See the W3C Intellectual Rights Notice and Legal Disclaimers for additional information. By publishing this document, W3C acknowledges that the Submitting Members have made a formal Submission request to W3C for discussion. Publication of this document by W3C indicates no endorsement of its content by W3C, nor that W3C has, is, or will be allocating any resources to the issues addressed by it. This document is not the product of a chartered W3C group, but is published as potential input to the W3C Process. A W3C Team Comment has been published in conjunction with this Member Submission. Publication of acknowledged Member Submissions at the W3C site is one of the benefits of W3C Membership. Please consult the requirements associated with Member Submissions of section 3.3 of the W3C Patent Policy. Please consult the complete list of acknowledged W3C Member Submissions. From this markup, tools can easily and reliably determine that http://lessig.org/blog/ is licensed under a CC Attribution License, v3.0, where attribution should be given to "Lawrence Lessig" at the URL http://lessig.org/. This paper explains the design rationale for these recommendations and illustrates some specific applications we expect ccREL to support. We begin with a review of the original 2002 recommendation for Creative Commons metadata and we explain why, as Creative Commons has grown, we have come to regard this as inadequate. We then introduce ccREL in the syntax-free model: as a vocabulary of properties. Next, we describe the recommended concrete syntaxes. In addition, we explain how other frameworks, such as microformats, can be made ccREL compliant. Finally, we discuss specific use cases and the types of tools we hope to see built to take advantage of ccREL. Creative Commons was publicly launched in December 2002, but its genesis traces to summer 2000 and discussions about how to promote a reasonable and flexible copyright regime for the Internet in an environment where copyright had become unreasonable and inflexible. There was no standard legal means for creators to grant limited rights to the public for online material, and obtaining rights often required difficult searches to identify rights-holders and burdensome transaction costs to negotiate permissions. As digital networks dramatically lowered other costs and engendered new opportunities for producing, consuming, and reusing content, the inflexibility and costs of licensing became comparatively more onerous. Under what license has a copyright holder released her work, and what are the associated permissions and restrictions? Can I redistribute this work for commercial purposes? Can I distribute a modified version of this work? How should I assign credit to the original author? Equally important is constructing a robust user-machine bridge for publishing and detecting structured licensing information on the Web, and stimulating the emergence of tools that lower the barriers to collaboration and remixing. For example, if a Web page contains multiple images, not all licensed identically, can users easily determine which rights are granted on a particular image? Can they easily extract this image, create derivative works, and distribute them while assigning proper credit to the original author? In other words, is there a clear and usable connection between what the user sees and what the machine parses? ccREL aims to be a standard that implementors can follow in creating tools that make these operations simple. The motivation for choosing RDF in 2001, and for continuing to use it now, is strongly connected to the Creative Commons vision: promoting scholarly and cultural progress by making it easy for people to share their creations and to collaborate by building on each other's work. In order to lower barriers to collaboration, it is important that the machine expression of licensing information and other metadata be interoperable. Interoperability here means not only that different programs can read particular metadata properties, but also that vocabularies--sets of related properties--can evolve and be extended. This should be possible in such a way that innovation can proceed in a distributed fashion in different communities--authors, musicians, photographers, cinematographers, biologists, geologists, an so on--so that licensing terms can be devised by local communities for types of works not yet envisioned. It is also important that potential extensions be backward compatible: existing tools should not be disrupted when new properties are added. If possible, existing tools should even be able to handle basic aspects of new properties. This is precisely the kind of "interoperability of meaning" that RDF is designed to support. Instantiating properties as URLs enables anyone to use those properties to formulate descriptions, or to discover detailed information about an existing property by consulting the page at the URL, or to make new properties available simply by publishing the URLs that describe those properties. As a case in point, Creative Commons originally defined its own "license" property, which it published at http://creativecommons.org/ns#license,8since no other group had defined in RDF the concept of a copyright license. When the XHTML Working Group introduced its own license property in 2005, we opted to start using their version, rather than maintain our own CC-dependent notion of license. We were then able to declare that http://creativecommons.org/ns#license is equivalent to the new property http://www.w3.org/1999/xhtml/vocab#license, simply by updating the description at http://creativecommons.org/ns#license. Importantly, RDF makes this equivalence interpretable by programs, not just humans, so that "old" RDF license declarations can be automatically interpreted using the new vocabulary. In general, atomic RDF descriptions are called triples. Each triple consists of a subject, a property, and a value for that property of the subject. 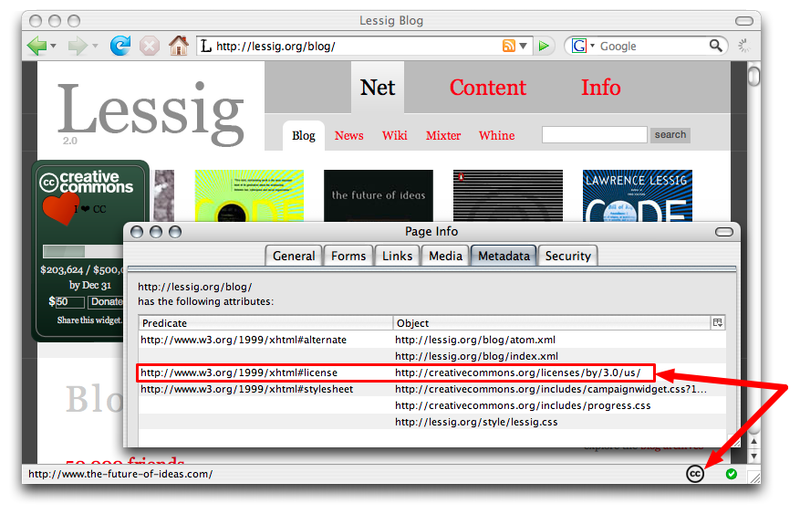 The triple that describes the license for Lessig's blog could be represented graphically as shown in figure 1: a point (the subject) labeled with the blog URL, a second point (the value) labeled with the license URL, and an arrow (the property) labeled with the URL that describes the meaning of the term "license", running from the blog to the license. In general, an RDF model, as a collection of triples, can be visualized as a graph of relations among elements, where the edges and vertices are all labeled using URIs. Figure 1: An RDF Triple represented as an edge between two nodes of a graph. One desirable feature of RDF/XML notation is that it is completely self-contained: all identifiers are fully qualified URLs. On the other hand, RDF/XML notation is extremely verbose, making it cumbersome for people to read and write, especially if no shorthand conventions are used. Even this simple example (verbose as it is) uses a shorthand mechanism: the second line of the description beginning xmlns:xhtml defines "xhtml:" to be an abbreviation for http://www.w3.org/1999/xhtml/vocab#, thus expressing the license property in its shorter form, xhtml:license, on the fourth line. @prefix xhtml: <http://www.w3.org/1999/xhtml/vocab#> . <http://lessig.org/blog/> xhtml:license <http://creativecommons.org/licenses/by/3.0/> . The shorthand does not provide improved compactness or readability if a prefix is only used once as above, of course. In N3, prefixes are typically defined only when they are used more than once, for example to express multiple properties taken from the same vocabulary. In RDF/XML, because of the stricter parsing rules of XML, there is a bit less flexibility: predicates can only be expressed using the shorthand, while subjects can only be expressed using the full URI. We knew at the time that this was a cumbersome design, but there was little alternative. RDF/XML, despite its verbosity, was the only standard syntax for expressing RDF. Worse, the Web Consortium's Semantic Web Activity was focused on providing organizations with ways to annotate databases for integration into the Web, and it paid scant attention to the issues of intermixing semantic information with visible Web elements. A task force had been formed to address these issues, but there was no W3C standard for including RDF in HTML pages. One consequence of CC's limited initial design is that, although millions of Web pages now include Creative Commons licenses and metadata, there is no uniform, extensible way for tool developers to access this metadata, and the tools that do exist rely on ad-hoc techniques for extracting metadata. Creative Commons no longer recommends using RDF/XML in HTML comments for specifying licensing information. This paper supersedes that recommendation. We hope that the new ccREL standard presented in this paper will result in a more consistent and stable platform for publishers and tool builders to build upon Creative Commons licenses. This section describes ccREL, Creative Commons' new recommendation for machine-readable licensing information, in its abstract form, i.e., independent of any concrete syntax. As an abstract specification, ccREL consists of a small but extensible set of RDF properties that should be provided with each licensed object. This abstract specification has evolved since the original introduction of CC properties in 2002, but it is worth noting that all first-generation licenses are still correctly interpretable against the new specification, thanks in large part to the extensibility properties of RDF itself. including under which license a Work is distributed. License properties describe aspects of licenses. Publishers will normally be concerned only with Work properties: this is the only information publishers provide to describe a Work's licensing terms. License properties are used by Creative Commons itself to define the authoritative specifications of the licenses we offer. Other organizations are free to use these components for describing their own licenses. Such licenses, although related to Creative Commons licenses, would not themselves be Creative Commons licenses nor would they be endorsed necessarily by Creative Commons. 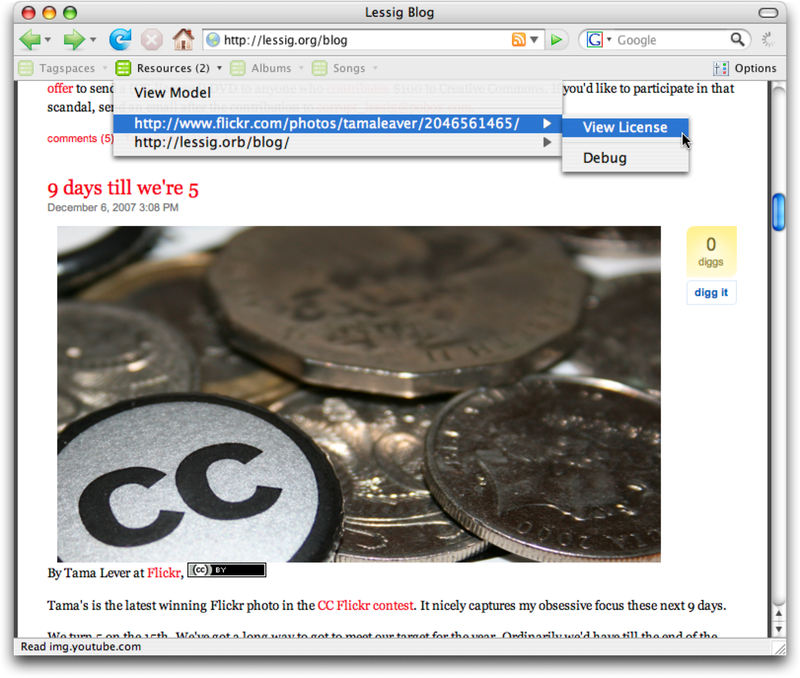 <http://lessig.org/blog/> dc:title "The Lessig Blog" . <http://lessig.org/blog/> cc:attributionName "Larry Lessig" . <http://lessig.org/blog/> cc:attributionURL <http://lessig.org/> . <http://lessig.org/blog/> dc:type dcmitype:Text . cc:attributionName - the name to cite when giving attribution when the work is modified or redistributed under the terms of the associated Creative Commons license.11 The prefix cc:, as mentioned above, is an abbreviation for http://creativecommons.org/ns#. cc:attributionURL - the URL to link to when providing attribution. dc:type - the type of the licensed document. In this example, the associated value is dcmitype:Text, which indicates text. Lessig's blog sometimes includes video, in which case the type would be dcmitype:MovingImage. Recommended use of dc:type is explained at http://dublincore.org/documents/dces/. Individual types like dcmitype:Text and dcmitype:MovingImage are part of the DCMI Vocabulary. @prefix dc: <http://purl.org/dc/elements/1.1/> . @prefix cc: <http://creativecommons.org/ns#> . @prefix dcmitype: <http://purl.org/dc/dcmitype/> . <http://lessig.org/blog/> dc:title "The Lessig Blog" ; cc:attributionName "Larry Lessig" ; cc:attributionURL <http://lessig.org/> ; dc:type dcmitype:Text . cc:morePermissions--indicates a URL that gives information on additional permissions beyond those specified in the CC license. For example, a document with a CC license that requires attribution, might, under certain circumstances, be usable without attribution. Or a document restricted for noncommercial use could be available for commercial use under certain conditions. The information at the designated URL is completely up to the publisher, as are the terms of the associated additional permissions, with one proviso: The additional permissions must be additional permissions, i.e., they cannot restrict the rights granted by the Creative Commons license. Said another way, any use of the work that is valid without taking the morePermissions property into account, must remain valid after taking morePermissions into account. This is the current set of ccREL Work properties. New properties may be added over time, defined by Creative Commons or by others. Observe that ccREL inherits the underlying extensibility of RDF--all that is required to create new properties is to include additional triples that use these. For example, a community of photography publishers could agree to use an additional photoResolution property, and this would not disrupt the operation of pre-existing tools, so long as the old properties remain available. We'll see below that the concrete syntax (RDFa) recommended by Creative Commons for ccREL enjoys this same extensibility property. Distributed creation of new properties notwithstanding, only Creative Commons can include new elements in the cc: namespace, because Creative Commons controls the defining document at http://creativecommons.org/ns#. This ability to retain this kind of control, without loss of extensibility, is a direct consequence of using RDF. We now consider properties used for describing Licenses. With ccREL, Creative Commons does not expect publishers to use these license properties directly, or even to deal with them at all. In contrast, Creative Commons' original metadata recommendation encouraged publishers to provide the license properties with every licensed work. This design was awkward, because once a publisher has already indicated which license governs the Work, specifying the license properties in addition is redundant and thus error prone. The ccREL recommendation does away with this duplication and leaves it to Creative Commons to provide the license properties. cc:permits - permits a particular use of the Work above and beyond what default copyright law allows. cc:prohibits - prohibits a particular use of the Work, specifically affecting the scope of the permissions provided by cc:permits (but not reducing rights granted under copyright). cc:requires - requires certain actions of the user when enjoying the permissions given by cc:permits. cc:jurisdiction - associates the license with a particular legal jurisdiction. cc:deprecatedOn - indicates that the license has been deprecated on the given date. cc:legalCode - references the corresponding legal text of the license. Importantly, Creative Commons does not allow third parties to modify these properties for existing Creative Commons licenses. That said, publishers may certainly use these properties to create new licenses of their own, which they should host on their own servers, and not represent as being Creative Commons licenses. cc:Reproduction - copying the work in various forms. cc:Distribution - redistributing the work. cc:DerivativeWorks - preparing derivatives of the work. cc:CommercialUse - using the Work for commercial purposes. cc:Notice - providing an indication of the license that governs the work. cc:Attribution - giving credit to the appropriate creator. cc:ShareAlike - when redistributing derivative works of this work, using the same license. cc:SourceCode - when redistributing this work (which is expected to be software when this requirement is used), source code must be provided. @prefix cc: http://creativecommons.org/ns# . <http://creativecommons.org/licenses/by-sa/3.0/> cc:permits cc:Reproduction ; cc:permits cc:Distribution ; cc:permits cc:DerivativeWorks ; cc:requires cc:Attribution ; cc:requires cc:ShareAlike ; cc:requires cc:Notice . As new copyright licenses are introduced, Creative Commons expects to add new permissions, requirements, and prohibitions. However, it is unlikely that Creative Commons will introduce new license property types beyond permits, requires, and prohibits. As a result, tools built to understand these three property types will be able to interpret future licenses, at least by listing the license's permissions, requirements, and prohibitions: thanks to the underlying RDF framework of designating properties by URLs, these tools can easily discover human-readable descriptions of these as-yet-undefined property values. While the previous examples illustrate ccREL using the RDF/XML and N3 notations, ccREL is meant to be independent of any particular syntax for expressing RDF triples. To create compliant ccREL implementations, publishers need only arrange that tool builders can extract RDF triples for the relevant ccREL properties--typically only the Work properties, since Creative Commons provides the License properties--through a discoverable process. We expect that different publishers will do this in different ways, using syntaxes of their choice that take into account the kinds of environments they would like to provide for their users. In each case, however, it is the publisher's responsibility to associate their pages with appropriate extraction mechanisms and to arrange for these mechanisms to be discoverable by tool builders. Creative Commons also recommends concrete ccREL syntaxes that tool builders should recognize by default, so that publishers who do not want to be explicitly concerned with extraction mechanisms have a clear implementation path. These recommended syntaxes--RDFa for HTML Web pages, and XMP for free-floating content--are described in the following sections. This section presents the principles underlying our recommendations. Independence and Extensibility: We cannot know in advance what new kinds of data we will want to integrate with Creative Commons licensing data. Currently, we already need to combine Creative Commons properties with simple media files (sound, images, videos) and there's a growing interest in providing markup for complex scientific data (biomedical records, experimental results). Therefore, the means of expressing the licensing information in HTML should be extensible: it should enable the reuse of existing data models and the addition of new properties, both by Creative Commons and by others. Adding new properties should not require extensive coordination across communities or approval from a central authority. Tools should not suddenly become obsolete when new properties are added, or when existing properties are applied to new kinds of data sets. DRY (Don't Repeat Yourself): An HTML document often already displays the name of the author and a clickable link to a Creative Commons license. Providing machine-readable structure should not require duplicating this data in a separate format. Notably, if the human-clickable link to the license is changed, e.g. from v2.5 to v3.0, a machine processing the page should automatically note this change without the publisher having to update another part of the HTML file to keep it "in sync" with the human-readable portion. Visual Locality: An HTML page may contain multiple items, for example a dozen photos, each with its own structured data, for example a different license. It should be easy for tools to associate the appropriate structured data with their corresponding visual display. Remix Friendliness: It should be easy to copy an item from one document and paste it into a new document with all appropriate structured data included. In a world where we constantly remix old content to create new content, copy-and-paste, widgets, and sidebars are crucial elements of the remixable Web. As much as possible, ccREL should allow for easy copy-and-paste of data to carry along the appropriate licensing information. Consistency: There are many different possible file types. The mechanism for embedding licensing information should be reasonably generic, so that a single tool can read and write the licensing information without requiring awareness of all file types. Publisher Accountability: It can be difficult to provide for accountability of licensing metadata when files are shared in peer-to-peer systems, rather than distributed from a central location. The method for expressing metadata should facilitate providing publisher accountability at least as strong as the accountability of a Web page with a well-defined host and owner. Simplicity: The process of embedding licensing information should require little more than a simple and free program. In particular, though complex publisher accountability approaches involving digital signatures and certificates can be used, they should not be required for the basic use case. @prefix xhtml: <http://www.w3.org/1999/xhtml#> . @prefix cc: <http://creativecommons.org/ns#> . <http://lessig.org/blog/> xhtml:license <http://creativecommons.org/licenses/by/3.0/> . <http://lessig.org/blog/> cc:attributionName "Lawrence Lessig" . <http://lessig.org/blog/> cc:attributionURL <http://lessig.org/> . What we would like is a way to quickly augment this HTML with just enough structure to enable the extraction of the RDF triples, using the principles articulated above, including, notably, Don't Repeat Yourself: the existing markup and links should be used both for human and machine readability. about defines the subject of all triples within the <div>. Here we have about="", which defines the subject to be the URL of the current document. xmlns:cc associates, throughout the <div>, the prefix cc with the URL http://creativecommons.org/ns#, much as N3 does with @prefix. property generates a new triple with predicate cc:attributionName, and the text content of the element, in this case "Lawrence Lessig," as the object. rel="cc:attributionURL" generates a new triple with predicate cc:attributionURL, and the URL in the href as the object. rel="license" generates a new triple with predicate xhtml:license, as xhtml is the default prefix for reserved XHTML values like license. The object is given by the href. The fragment of HTML (within the div) is entirely self-contained (and thus remix-friendly). Its meaning would be preserved if it were copied and pasted into another Web page. The data's structure is local to the data itself: a human looking at the page could easily identify the structured data by pointing to the rendered page and finding the enclosing chunk of HTML. In addition, the clickable links and rendered author names gain semantic meaning without repeating the core data. Finally, as this is embedded RDF, the extensibility and independence properties of RDF vocabularies are automatically inherited: anyone can create a new vocabulary or reuse portions of existing vocabularies. Figure 2: RDFa markup of a Creative Commons license notice, illustrating all the current CC Work properties, including the rendering of this markup in a Web browser. Of course, one can continue to add additional data, both visible and structured. 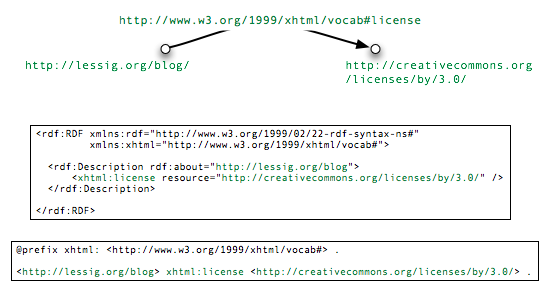 Figure 2 shows a more complex example that includes all Work properties currently supported by Creative Commons, including how this HTML+RDFa would be rendered on a Web page. Notice how properties can be associated with HTML spans as well as anchors, or in fact with any HTML elements--see the RDFa specification for details. The examples in this section illustrate how publishers can specify Work properties. One can also use RDFa to express License properties. This is what Creative Commons does with the license description pages on its own site, as described below in section 7.2. Microformat designers have focused on simplicity and readability, and Creative Commons encourages publishers who use microformats to make it easy for tool builders to extract the relevant ccREL triples. Nonetheless, microformats' syntactic simplicity comes at the cost of independence and extensibility, which makes them limited from the Creative Commons perspective. For example, every time a Creative Commons license needs to be expressed in a new context--e.g. videos instead of still images--a new microformat and syntax must be designed, and all parsers must then, somehow, become aware of the change. It is also not obvious how one might combine different microformats on a single Web page, given that the syntax rules may differ and even conflict from one microformat to the next.15 Finally, when it comes time to express complex data sets with ever expanding sets of properties, e.g., scientific data, microformats do not appear to scale appropriately, given their lack of vocabulary scoping and general inability to mix vocabularies from independently developed sources--the kind of mixing that is enabled by RDF's use of namespaces. Thus, Creative Commons does not recommend any particular microformat syntax for ccREL, but we do recommend a method for ensuring that, when publishers use microformats, tool builders can extract the corresponding ccREL properties: use an appropriate profile URL in the header of the HTML document.16This profile URL significantly improves the independence and extensibility of microformats by ensuring that the tools can find the appropriate parser code for extracting the ccREL abstract model from the microformat, without having to know about all microformats in advance. One downside is that the microformat syntax then becomes less remix-friendly, with two disparate fragments: one in the head to declare the profile, and one in the body to express the data. Even so, the profile approach is likely good enough for simple data. It is worth noting that this use of a profile URL is already recommended as part of microformats' best practices, though it is unfortunately rarely implemented today in deployed applications. Not all documents on the web are HTML: one popular syntax for representing structured data in XML. Given that XML is a machine-readable syntax, often with a strict schema depending on the type of data expressed, not all of the principles we outlined are useful here. In particular, visual locality is not relevant when the reader is a machine rather than a human, and remix-friendliness doesn't really apply when XML fragments are rarely remixable in the first place, given schema validation. Thus, we focus on independence and extensibility, as well as DRY. Similarly, the Open Archives Initiative, defines a complex XML schema for library resources.19 These resources may include megabytes of data, including sometimes the entire resource in full text. Using XSLT, one can extract the relevant ccREL information, exactly as above. Using GRDDL, the Open Archives Initiative can specify the XSLT in its XML schema file, so that all OAI documents are automatically transformable to RDF/XML, which immediately conveys ccREL. Direct RDF/XML embedding in XML. Interestingly, because RDF can be expressed using the RDF/XML syntax, one might be tempted to use RDF/XML directly inside an XML document with an appropriate schema definition that enables such direct embedding. This very approach is taken by SVG,20 and there are cases of SVG graphics that include licensing information using directly embedded RDF/XML. This approach can be made ccREL compliant with very little work--a simple GRDDL transform, declared in the XML schema definition, that extracts the RDF/XML and expresses it on its own. Note that, for ccREL compliance, this transform, although simple, is necessary. The reason for its necessity goes to the crux of the ccREL principles: without such a transform provided by each XML schema designer, tools would have to be aware of all the various XML schemas that include RDF/XML in this way. For extensibility and future-proofing, ccREL asks that publishers of the schema make the effort to provide the extraction mechanism. With explicit extraction mechanisms, publishers have a little bit more work to do, while tool builders are immediately empowered to create generic programs that can process data they have never seen before. Accountability: providing minimal accountability for the expressed ccREL data. We handle accountability for free-floating content by connecting any free-floating document to a Web page, and placing the ccREL information on that Web page. Thus, publishers of free-floating content are just as accountable as publishers of Web-based content: rights are always expressed on a Web page. The connection between the Web page and the binary file it describes is achieved using a cryptographic hash, i.e. a fingerprint, of the file. For example, the PDF file of Lawrence Lessig's "Code v2" will contain a reference to http://codev2.cc/download+remix, which itself will contain a reference to the SHA1 hash of the PDF file. The owner of the URL http://codev2.cc/download+remix is thus taking responsibility for the ccREL statements it makes about the file. This RDFa references the PDF using its SHA1 hash--a secure fingerprint of the file that matches only the given PDF file--and declares its Creative Commons license. Thus, anyone that finds the "Code v2" PDF can find its WebStatement pointer, look up that URL, verify that it properly references the file via its SHA1 hash, and confirm the file's Creative Commons license on the web-based deed. This section describes several examples, first by publishers of Creative Commons licensed works, then by tool builders who wish to consume the licensing information. Some of these examples include existing, real implementations of ccREL, while others are potential implementations and applications we believe would significantly benefit from ccREL. Publishers can mix ccREL with other markup with great flexibility. Thanks to ccREL's independence and extensibility principle, publishers can use ccREL descriptions in combination with additional attributes taken from other publishers, or with entirely new attributes they define for their own purposes. Thanks to ccREL's DRY principle, even small publishers get the benefit of updating data in one location and automatically keeping the human- and machine-readable in sync. Figure 3: Markup for a Bitmunk Song: this is a real excerpt of the actual HTML markup used on the bitmunk.com web site, slightly simplified and indented for readability. A common use case for Web publishers working in a mashup-friendly world is the issue of mixing content with different licenses. Consider, for example, what happens if Larry Lessig's blog reuses an image published by another author and licensed for non-commercial use. Recall that Lessig's Blog is licensed to permit commercial use. The inner <div> uses the about attribute to indicate that its statements concern the photo in question. A link to the original source is provided using the dc:source property, and a different license pointer is given for this photo using the normal anchor with a rel="license" attribute. Bitmunk is a service that supports artists with a legal, copyright-aware, content distribution service. The service needed a mechanism for embedding structured data about songs and albums directly into their web pages, including licensing information, so that browser add-ons might provide additional functionality around the music, e.g. comparing the price of a particular song at various online stores. Bitmunk first created a microformat called hAudio. They soon realized, however, that they would be duplicating fields when it came time to define hVideo, and that these duplicated fields would no longer be compatible with those of hAudio. More immediately problematic, hAudio's basic fields, e.g. title, would not be compatible with other "title" fields of other microformats. Thus, Bitmunk created the hAudio RDFa vocabulary. The design process for this vocabulary immediately revealed separate, logical components: Dublin Core for basic properties e.g. title, Creative Commons for licensing, a new vocabulary called "hMedia" for media-specific properties e.g. duration, and a new vocabulary called "hCommerce" for transaction-specific properties e.g. price. Bitmunk was thus able to reuse two existing vocabularies and add features. It was also able to clearly delineate logical components to make it particularly easy for other vocabulary developers to reuse only certain components of the hAudio vocabulary, e.g. hCommerce. Meanwhile, all Creative Commons licensing information is still expressible without alteration. Figure 3 shows an excerpt of the markup available from Bitmunk at http://bitmunk.com/view/media/6579151. Note that this particular sample is not CC-licensed: it uses standard copyright. A CC-licensed album would be marked up in the same way, with a different license value: Bitmunk was able to develop its vocabulary independent of ccREL, and can now integrate with ccREL simply by adding the appropriate attributes. Figure 4: A Flickr Photo Page with RDFa: this is an excerpt from a Flickr photo page with small amounts of additional markup to show how one would integrate RDFa. The rendering of the HTML is identical with the added RDFa properties. Note the Flickr machine tag upcoming:event, which references an event at upcoming.org. This machine tag is, in fact, an RDF triple, easily expressed in RDFa alongside existing Flickr information and CC licensing. Flickr hosts approximately 50 million CC-licensed images (as of October 2007). Currently Flickr denotes a license on each image's page with a link to the relevant license qualified by rel="license". This ad-hoc convention, encouraged by the microformats effort, was "grandfathered" into RDFa thanks to the reserved HTML keyword license. Unfortunately, it works only for simple use cases, with a single image on a single page. This approach breaks down when multiple images are viewed on a single page, or when further information, such as the photographer's name, is required. License assertions scoped to the image being licensed. A cc:additionalPermissions reference to commercial licensing brokers and a dc:source reference to parent works. XMP embedding in images themselves. In addition, Flickr recently deployed "machine tags," where photographers can add metadata about their images using custom properties. Flickr's machine tags are, in fact, a subset of RDF, which can be represented easily using RDFa. Thus, Creative Commons licensing can be easily expressed alongside Flickr's machine tags using the same technology, without interfering. Figure 4 shows how the CC-licensed photo at http://www.flickr.com/photos/laughingsquid/2034629532/ would be marked up using ccREL, including the machine tag upcoming:event that associates the photo with an event at http://upcoming.org. Figure 5: Markup for a Nature Precedings article, including how RDFa might be integrated seamlessly into the existing markup. The property nature:tag is used to indicate a Nature-defined way of tagging content, though another vocabulary could easily be used here. Figure 6: Portions of a Nature Precedings paper, marked up with RDFa. An RDFa-aware browser (in this case any normal browser using the RDFa Bookmarklets) detects the markup, highlighting the title and Creative Commons license, and revealing the corresponding RDF triples. Nature, one of the world's top scientific journals, recently launched a web-only "precedings" site, where early results can be announced rapidly in advance of full-blown peer review. Papers on Nature Precedings are distributed under a Creative Commons license. Like Flickr, Nature Precedings currently uses CC's prior metadata recommendation: RDF/XML included in an HTML comment. Nature could significantly benefit from the ccREL recommendation, which would let them publish structured Creative Commons licensing information in a more robust, more extensible, and more human-readable way. Consider, for example, the Nature Preceding paper at http://precedings.nature.com/documents/1290/version/1. Figure 5 shows how the markup at that page can be extended with simple RDFa attributes, using the Dublin Core, Creative Commons, FOAF, and PRISM publication vocabularies.21Notice how any HTML element, including the existing H1 used for the title, can be used to carry RDFa attributes. Figure 6 shows how this page could appear in an RDFa-aware browser. Open publication of scientific data on the Internet has begun, with the Nature Publishing Group recently announcing the release of genomic data sets under a Creative Commons license.22 Beyond simple licensing, thousands of new metadata vocabularies and properties are being developed to express research results. Creative Commons, through its Science Commons subsidiary,23 is playing an active role here, working to remove barriers to scientific cooperation and sharing. Science Commons is specifically encouraging the creation of RDF-based vocabularies for describing scientific information and is stimulating collaboration among research communities with tools that build on RDF's extensibility and interoperability. Figure 7: A simple rendering of a bibliographic entry with extra scientific data. As these vocabularies become more widespread, it's easy to envision uses of ccREL and RDFa that extend the bibliographic and licensing markup to include these new scientific data tags. Tools may then emerge to take advantage of this additional markup, enabling dynamic, distributed scientific collaboration through interoperable referencing of scientific concepts. Imagine, for example, an excerpt from a (hypothetical) Web-based newsletter about genomics research, which references an (actual) article from BioMed Central Neurosciences, as it might be rendered by a browser (Figure 7). The words "recent study on rat brains", and "CEBP-beta" are clickable links, leading respectively, to a Web page for the paper, and a Web page that describes the protein CEBP-5#5 in the Uniprot protein database. This RDFa not only links to the paper in the usual way, but it also provides machine-readable information that this is a statement about inflammatory stimuli (as defined by the Open Biomedical Ontologies initiative) activating expression of the CEPB protein (as specified in the UniProt database of proteins). Since the URI of the protein is visually meaningful, it can be marked up with a clickable link that also provides the object of a triple. This snippet contains two statements: the public CC license and the availability of more permissions. Sophisticated users of this protocol will one day publish company, media, or genre-specific descriptions of the permissions available privately at the target URL. Tools built to recognize a Creative Commons license will still be able to detect the Creative Commons license after the addition of the morePermissions property, which is exactly the desired behavior. More sophisticated versions of the tools could inform the user that "more permissions" may be granted by following the indicated link. Figure 8: Part of the HTML code for the Creative Commons Attribution, No Derivatives Deed (slightly simplified for presentation purposes) showing the use of ccREL License Properties. As mentioned above, Creative Commons doesn't expect content publishers to deal with license properties. However, others may find themselves publishing licenses using ccREL's license properties. Here, too, RDFa is available as a framework for creating license descriptions that are human-readable, from which automated tools can also extract the required properties. One example of this is Creative Commons itself, and the publication of the "Commons Deeds". Figure 8 shows the HTML source of the Web page at http://creativecommons.org/licenses/by-nd/3.0/us/ which describes the U.S. version of the CC Attribution-NoDerivatives license. As this markup shows, any HTML attribute, including LI, can carry RDFa attributes. The href attribute, typically used for clickable links, can be used to indicate a structured relation, even when the element to which it is attached is not an HTML anchor. In this markup, the "Attribution-NoDerivatives" license permits distribution and reproduction, while requiring attribution and notice. Recall that ccREL is meant to be interpreted in addition to the baseline copyright regulation. In other words, the restriction "NoDerivatives" is not expressed in ccREL, since that is already a default in copyright law. The opposite, where derivative works are allowed, would be denoted with an additional CC permission. MozCC25 is an extension to Mozilla-based browsers for extracting and displaying metadata embedded in web pages. MozCC was initially developed in 2004 as a work-around to some of the deficiencies in the prior Creative Commons metadata recommendation. That version of MozCC specifically looked for Creative Commons RDF in HTML comments, a place most other parsers ignore. Once the metadata detected, MozCC provided users with a visual notification, via icons in the status bar, of the Creative Commons license. In addition, MozCC provided a simple interface to expose the work and license properties. Since the initial development, MozCC has been rewritten to provide general purpose extraction of all RDFa metadata, as well as a specialized interface for ccREL. The status-bar icons and detailed metadata visualization features have been preserved and expanded. A MozCC user receives immediate visual cues when he encounters a page with RDFa metadata, including specific CC-branded icons when the metadata indicates the presence of a Creative Commons license. The experience is pictured in Figure 9. Figure 9: The MozCC Mozilla Add-On. The status bar shows a CC icon that indicates to the user that the page is CC-licensed. A click on the icon reveals the detailed metadata in a separate window. The results of each extractor are stored in a local metadata store. In the case of Firefox, this is a SQLite database stored as part of the user's profile. The local metadata store serves as an abstraction layer between the extractors and user interface code. The contents are visible through the Page Info interface. The current software only exposes this information as status bar icons; one can imagine other user interfaces (provided by MozCC or other extensions) which expose the metadata in different ways. Operator26is an add-on to the Firefox browser that detects microformats and RDFa in the web pages a user visits. Operator can be extended with "action scripts" that are triggered by specific data found in the web page. The regions of the page that contain data are themselves highlighted so that users can visually detect and receive contextual information about the data. It is relatively straight-forward to write a Creative Commons action script that finds all Creative Commons licensed content inside a web page by looking for the RDFa syntax. This allows users to easily identify their rights and responsibilities when reusing content they find on the web. No matter the item, even types of items with properties currently unanticipated, the simple action script can detect them, display the item's name and rights description. Once this action script enabled, Operator automatically lights up Creative Commons licensed "Resources" it finds on the web. For example, browsing to the Lessig blog, Operator highlights two resources that are CC-licensed: the Lessig Blog itself, and a Creative Commons licensed photo used in one of the blog posts. The result is shown in Figure 10. Figure 10: Operator with a CC action script on Lessig's Blog. Notice the two resources, each with its "view license" action. Creative Commons wants to make it easy for artists and scientists to build upon the works of others when they choose to: licensing your work for reuse and finding properly licensed works to reuse should be easy. To achieve this on the technical front, we have defined ccREL, an abstract model for rights expression based on the W3C's RDF, and we recommend two syntaxes for web-based and free-floating content: RDFa and XMP, respectively. The major goal of our technological approach is to make it easy to publish and read rights expression data now and in the future, when the kinds of licensed items and the data expressed about them goes far beyond what we can imagine today. By using RDF, ccREL links Creative Commons to the fast-growing RDF data interoperability infrastructure and its extensive developer toolset: other data sets can be integrated with ccREL, and RDF technologies, e.g. data provenance with digital signatures, can eventually benefit ccREL. We believe that the technologies we have selected for ccREL will enable the kind of powerful, distributed technological innovation that is characteristic of the Internet. Anyone can create new vocabularies for their own purposes and combine them with ccREL as they please, without seeking central approval. Just as we did with the legal text of the licenses, we aim to create the minimal infrastructure required to enable collaboration and invention, while letting it flourish as an organic, distributed process. We believe ccREL provides this primordial technical layer that can enable a vibrant application ecosystem, and we look forward to the community's innovative ideas that can now freely build upon ccREL. The authors wish to credit Neeru Paharia, past Executive Director of Creative Commons, for the "free-floating" content accountability architecture, Manu Sporny, CEO of Bitmunk, for the Creative Commons Operator code, and Aaron Swartz for the original Creative Commons RDF data model and metadata strategy. More broadly, the authors wish to acknowledge the work of a number of W3C groups, in particular all members of the RDF-in-HTML task force (Mark Birbeck, Jeremy Carroll, Michael Hausenblas, Shane McCarron, Steven Pemberton, and Elias Torres), the Semantic Web Deployment Working Group chaired by Guus Schreiber and David Wood, and the tireless W3C staff without whom there would be no RDFa, GRDDL, or RDF, and thus no ccREL: Eric Miller, Ralph Swick, Ivan Herman, and Dan Connolly. Information about Creative Commons is available on the web at http://creativecommons.org. ccREL is a trademark of Creative Commons, see http://creativecommons.org/policies for details. RDF is a language for representing information about resources in the World Wide Web. We provide a short primer in this paper. Also, see the Web Consortium's RDF Web site at http://www.w3.org/RDF/. By "publisher" we mean anyone who places CC-licensed material on the Internet. By "tool builders" we mean people who write applications that are aware of the license information. Example tools might be search programs that filter their results based on specific types of licenses, or user interfaces that display license information in particular ways. RDFa is an emerging collection of attributes and processing rules for extending XHTML to support RDF. See the W3C Working Draft "RDFa in XHTML: Syntax and Processing" at http://www.w3.org/TR/rdfa-syntax. The "RDFa Primer: Embedding Structured Data in Web Pages," may be found at http://www.w3.org/TR/xhtml-rdfa-primer. RDF/XML, described briefly below, is a method for expressing RDF in XML syntax. See "RDF/XML Syntax Specification (Revised)," W3C Recommendation 10 February 2004 at http://www.w3.org/TR/rdf-syntax-grammar/. XMP (Extended Metadata Platform) is a labeling technology developed by Adobe, for embedding constrained RDF/XML within documents. See http://www.adobe.com/products/xmp/. The Semantic Web Activity is a large collaborative effort led by the W3C aimed at extending the Web to become a universal medium for data exchange, for programs as well as people. See http://www.w3.org/2001/sw/. The term URI (universal resource identifier) is a generalization of URL (universal resource locator). While a URL refers in principle to a resource on the Web, a URI can designate anything named with this universal hierarchical naming scheme. This generality is used in ccREL for items such as downloaded media files. The vocabulary page, http://www.w3.org/1999/xhtml/vocab#, is currently a placeholder which the W3C expects to update in early 2008. The full story is a little more complicated. CC initially used the http://web.resource.org/cc/ namespace, migrating to http://creativecommons.org/ns# for superior human interaction with the vocabulary when it became apparent RDFa would facilitate this. In 2004 the Dublin Core Metadata Initiative approved a "license" refinement of its "rights" term (see http://dublincore.org/usage/decisions/2004/2004-01.Rights-terms.shtml). Had http://purl.org/dc/terms/license existed in 2002, CC would not have defined http://web.resource.org/cc/license. 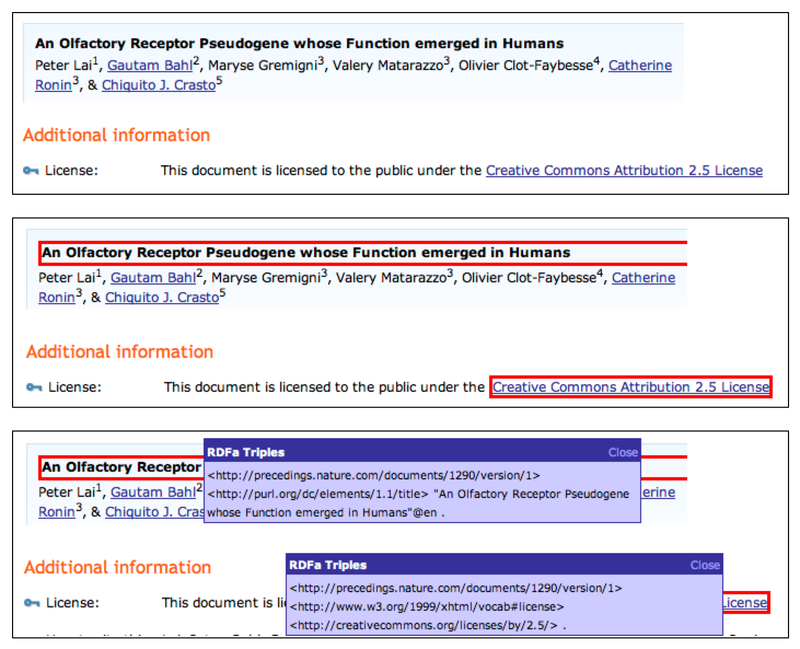 Thanks to the extensibility properties of RDF, http://creativecommons.org/ns#license describes its relationship to each of these other properties. N3 (Notation 3) was designed to be a compact and more readable alternative to RDF/XML. See http://www.w3.org/DesignIssues/Notation3.html. The Dublin Core Metadata Initiative (DCMI) promotes the widespread adoption of interoperable metadata standards, and maintains a vocabulary of DCMI Metadata Terms. See http://dublincore.org/. All current Creative Commons licenses require attribution, and give the publisher the option of specifying a URL with attribution information. The cc:attributionURL property is the preferred way to provide this URL in machine-readable form. Caveat: The text descriptions of these property values are indicative only. The precise legal interpretations of the properties can be subtle and even jurisdiction dependent. Consult the full Creative Commons licenses ("legal code") for the actual legal definitions. It is worth noting that, while the xhtml:license property has long been a part of the CC specification, the cc:attributionName and cc:attributionURL properties are new with ccREL. Under the independence and extensibility principle, the solution we select for embedding ccREL in HTML should allow for such extensions without breaking tools that already know about xhtml:license. See http://microformats.org/wiki/grouping-brainstorming for one discussion. Profile URLs indicate that the HTML file can be interpreted according to the rules of that profile. This property has been used by some microformat specifications to indicate, e.g., "this page contains the hCard microformat". The property is also used by GRDDL for generic HTML transformations to RDF/XML, though this approach to RDF extraction from HTML is not fully compliant with the principles laid out in this paper: it is difficult to tell which image on a page is CC-licensed when the RDF extraction is achieved via GRDDL. Gleaning Resource Descriptions from Dialects of Languages (GRDDL) (http://www.w3.org/TR/grddl/) is a W3C recommendation for linking Web documents to algorithms that extract RDF data from the document. Atom License Extension. See http://tools.ietf.org/html/rfc4946. Scalable Vector Graphics, http://www.w3.org/Graphics/SVG/, a W3C Recommendation for vector graphics expressed using XML. The Publishing Requirements for Industry Standard Metadata (PRISM) provides a vocabulary for publishing and aggregating content from books, magazines, and journals. See http://www.prismstandard.org/. Operator currently does not handle HTML reserved keywords, such as rel="license". Thus, we consider the script for the property cc:license, and provide examples appropriately adjusted. This gap is expected to be filled by early 2008.